We are proud to offer New Earth Superfoods! 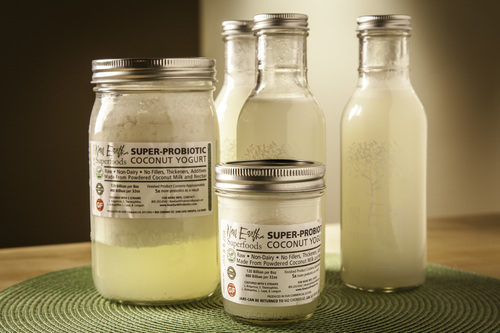 As our Featured Local Vendor from January 1 – 15, all New Earth Superfoods products are on sale. It all started when founders Rishi and Eva discovered the importance of micro-organisms in the environment and in the body. With more thoughtful research, they found that fermented and cultured foods could combat a variety of health challenges and support the path to optimal health. Particular foods, like coconut, unveiled especially amazing properties when combined with probiotics. These high-potency, cultured yogurts could be used as a supplement to improve gut-health or used topically to treat a variety of skin conditions. After experiencing the benefits of cultured coconut yogurts first-hand, it became their passion and mission to share this miraculously healing food with all those who sought to experience the benefits. Alas, New Earth Superfoods, was born. With a dedication to quality, New Earth Superfoods products are made locally in San Luis Obispo with ingredients that have not been treated with harmful substances or been pasteurized, synthetically altered, or been exposed to chemical treatments. These revolutionary products are completely raw, vegan, gluten-free, and made with non-GMO ingredients. Did we mention they are incredibly delicious? Super-Probiotic Coconut Yogurt: A 100% non-dairy “Living” Kefir culture yogurt that can be consumed daily to re-balance the gastrointestinal bacteria of the body. Unlike most commercial probiotics, this yogurt is designed to survive storage, stomach acids, and deliver the potency indicated on the label. Probiotic Chocolate: A chocolate bar made without any sugar but instead with freeze dried fruits, coconut water or monk fruit, depending on availability. As our January 2018 Featured Local Vendor, we are offering special pricing on New Earth Superfoods products, including Non-Dairy Super-Probiotic Coconut Yogurt and chocolates. Stop by SLO Natural Foods Co-op between January 1 - January 15th to experience their supreme taste and amazing benefits! For more information, head to the New Earth Superfoods' website and be sure to like their Facebook Page.